If all our yesterdays, todays and tomorrows are nothing but electric waterfalls and we continue to assimilate floods of information and experiences into the silvery metallic chatter of digital consciousness, then how do we retain our humanity, individuality and take control of the big data? As Lyn Robinson and David Bawden steer us to the shore of our Data, Information and Technology classes, I find myself on the precipice of the deep seas and the deeper questions. As tempting as it is to paddle back upstream, perhaps this is a chance to reflect and find some resolution. There are many lessons learnt from our enlightening classes, but the ones that stick with me most are the principles for Librarians to employ empathy, understanding, and a marginal level of order over our messy data. Some of these virtues are clearly achievable, like showing the insight and patience in teaching information literacy to service users. Whilst others, like casting a net of accountability over Google, algorithms and the internet, are infinitely more complex. Human nature is a whirlpool of disordered, emotive and spontaneously generated data. Despite our best intentions and the efforts to mechanise our day to day lives, we cannot swim away from the physical laws that bind us as creatures of stardust, clay, fire and thundering heartbeats. The mobile phones in our pockets and iPads in our palms are decoys that will try to fool you otherwise. The maelstrom of the world and everyday life is full of rather perplexing lessons and for most individuals, interactions with nature, faith, the sublime and fellow human beings no longer present all the answers. The inclusion of a digital online space has complicated matters increasingly. We are lured to the internet and social media to seek answers. Facebook, Twitter, Apple and Microsoft are monolithic giants. Far from babbling brooks, they offer individuals open access and the opportunity to overflow, rant and rave their innermost thoughts and beliefs into the database driven algorithmic systems. (Sutton, D. et al 2007). The cognitive scientist Marvin Minsky defined A.I by stating ‘Artificial intelligence is the science of making machines do things that would require intelligence if done by men.’ (Warwick, K. 2012). What A.I is able to achieve through digital technology, is a transformation and immersion of reality, and the potential to extract information could go beyond anything a human could achieve. It alters the individual’s experiences from traditional interaction and observation to an instantaneous and accessible digital consciousness. A.I is a river that has carved and hewn its existence onto the internet, virtual reality, galleries, museums and libraries. One of the big ethics for Library and Information professionals is to question whether the invasion of A.I into our day to day lives is a blessing or whether there are sea monsters lurking in its hidden depths? A.I technologies are increasingly relied upon by big data companies with massive capital. There is a risk that creating such A.I for marketing products, influencing behaviour, sparking beliefs, challenging crimes or gaining profit will certainly detriment how we are able to access open and free information. (Floridi, L. 2016). So far none of this technology is fully independent and in all cases the A.I requires a human creator and is a product of a human designed experience. So long as companies are challenged to actively represent the best of inherently human traits, combining logic, creativity and compassion, then so will our A.I. The cynical among us will see the flood of A.I as the beginning of a Terminator style takeover, but I am ever the romanticist and optimist. This is a turning point for the Library and Information profession and a chance for us to be a guiding hand in the management and control of the big data. 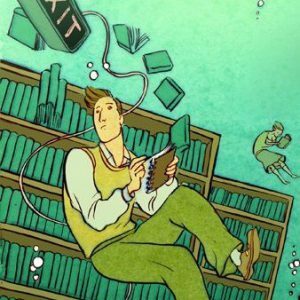 Librarians are striving for knowledge, but it is a fruitless path if we do not also have the wisdom to share it. We cannot just sit behind issue desks, loaning out resources like machines. After all, people are remarkably fascinating, beautiful and complex and it takes a certain talent for kindness and activism to reach out to them, work with them and help them grow. Technology as a tool may come and go, but a Librarian with a warm smile and a cargo full of information can never be lost. So let’s get out there, hoist the sails, shout from our ships and share a little of our wisdom with the world! https://aeon.co/essays/true-ai-is-both-logically-possible-and-utterly-implausible. (Accessed: 05 December 2017). Sutton, D. Brind, S. & McKenzie, R. (2007). The State of the Real: Aesthetics in the Digital Age. I.B. Tauris. London. UK. Warwick, K. (2012). Artificial Intelligence: The Basics. Routledge. Abingdon. UK. Floridi, L. (2014). The 4th Revolution: How the Infosphere is Reshaping Human Reality. Oxford University Press. Oxford. UK. Floridi, L. (2010). Information: A Very Short Introduction. Oxford University Press. Oxford. UK. Bell, A. (2017). Tomorrow’s Mind. [collage]. UK.